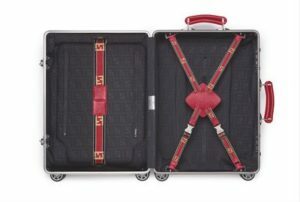 All Aboard With Fendi and Rimowa ! 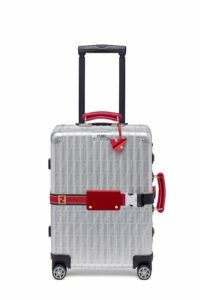 Fendi and Rimowa renew their partnership with this edgy and stylish cabin trolley. A touch of vintage adds charm to this cabin trolley, made in top-of-the-line aluminium. Equipped with an innovative multi-wheel system, be sure you are in for a smooth, effortless travel experience. The partnership showcases Rimowa’s iconic style, unique craftsmanship and impeccable high-quality design. The Fendi details, featured in Cuoio Romano leather, make this a fabulous combination. Available as a cabin/carry-on case, these gorgeous pieces flaunt the sophisticated, emblematic double “F” logo with a brushed effect on the aluminum, with the play of light giving it different hues. The black, red, or blue Cuoio Romano leather handles on the top and side, along with the web belt that runs across the case ton sur ton with the handles, featuring the “FF” logo, make these cases a must have. Introducing two new colors, blue and red, in addition to the black and yellow version presented in November 2017, these signature cases are turning heads. Elegant neoprene black lining with a black-on-black embossed “FF” logo and the individually adjustable Flex-Divider ensures that the case is exceptionally functional. In 1937, Rimowa revolutionized the world of travel when it started the production of lightweight luggage made of aluminum. The brand has remained true to its heritage and left the core concept of the aluminum case unchanged, but has unceasingly updated and enhanced its details. The Fendi x Rimowa case features the iconic characteristics of all Rimowa luggage – a Multi-wheel system for optimum maneuverability, two TSA-approved locks and a dedicated cover-up. 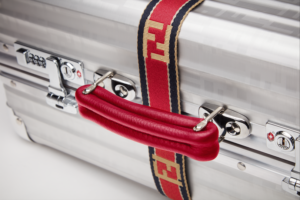 Taking personalization to the next level, it comes complete with unique stickers and a name tag in Cuoio Romano leather placed on the external belt which can be customized—a staple feature in Fendi bags. A new exciting paper plane-like charm, Airbag, made entirely in Cuoio Romano leather, with Fendi iconic Bag Bugs eyes feature, gives a further twist to the trolley. This accessory is also available in blue, yellow and red to match the color of the trolley. Now available in selected Fendi and Rimowa stores and on fendi.com as of June 2018, just in time for your travels.